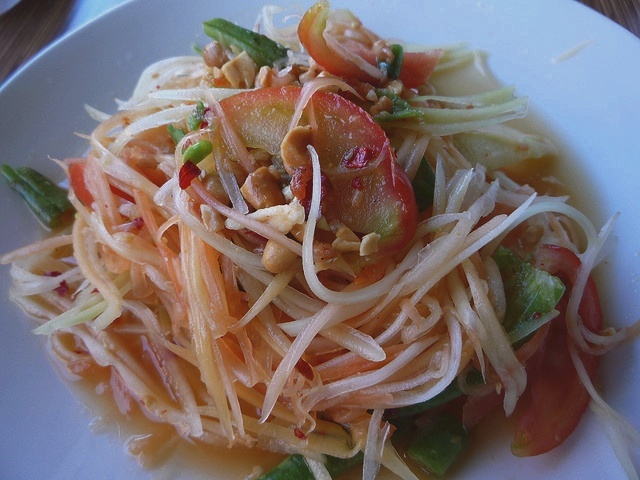 Green Papaya Salad (Som tum) muddled with dried shrimp, fish sauce, roasted peanuts and lime. Peel the green papaya with a sharp knife, then slice it in half and use a spoon to scrape out the seeds. Using the largest grater you have, grate the papaya, or you can use a potato peeler to create thin, ribbon-like strips. Place in a large bowl. Cook long beans in medium saucepan of boiling salted water until crisp-tender, about 5 minutes. Rinse under cold water. Cut into 2-inch pieces. Combine cooked long beans, cherry tomatoes together in the large bowl. Dressing: Combine palm sugar, fish sauce and lime juice. Mix till sugar dissolves. Add in diced garlic, chilli padi and chopped coriander leaves. Mix well. Pour dressing over the large bowl and toss. Sprinkle dried baby shrimp and peanuts over and serve. Note: You can prepare this salad ahead of time, combine all ingredients except the nuts and the dressing. Leave it covered in the refrigerator for few hours, or overnight. Add the dressing, dried shrimp and peanuts at the last minute, then toss and serve. Good recipe, but unnecessarily complicated. what a lovely recipe, and I looking forward to making this papaya salad. there is also now a ‘julienne’ peeler that makes uniform long slivers and is a lot safer, still authentic as it is used for green mangoes in thailand. Wow! i’ve been craving for these forever!! thanks for posting the recipe!!! definitely going to make these.